You know when you get in from work, or school, you are hungry and really feel like something tasty to eat and quick to make. Noodles are a great option because they can be prepared very quickly and topped with an assortment of quickly stir fried vegetables, chicken, prawns or fish. They can be the basis of a tasty nutritious meal. Noodles made from rice are suitable for a sensitive gut as they are low in FODMAPS. The thread like rice noodles simply need soaking in boiling water for 5 minutes and then left to drain in a sieve. 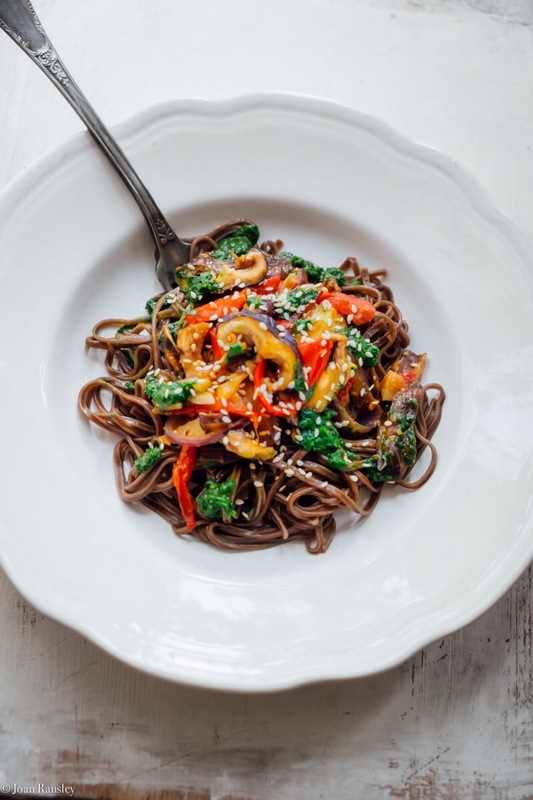 The other kind of noodle I think work really well with a stir fry are buckwheat or soba noodles which are also low in FODMAPs. Some soba noodles have a little wheat added but this should not cause a problem unless you are coeliac and cannot tolerate gluten. The preparation of the soba noodles is the same as for rice noodles. Allow about 50 – 75g per person, place them in a bowl and cover them with boiling water for 5 minutes, or until soft, and then drain. I have included a small amount of shitake mushrooms in the stir fry mix in this recipe because I really like them. But mushrooms do contain mannitol, a kind of polyol, that can ferment in the gut. Some people can tolerate a very small amount. I have only used three small shitake mushrooms shared betweeen the four portions this recipe makes, which can be picked out or enjoyed depending on which side of the fence you sit on with regard to eating them. Adding a little miso stock to the sliced vegetables as they are frying gives mositure to the dish and means you do not have to use very much oil as you cook the vegetable. It creates a concentrated savoury sauce, pepping up any vegetable or meat juices as they escape during cooking. In this recipe I made a coriander oil to finish the dish before topping it with toasted sesame seeds. It looked stunning and tasted delicious. Prep up all the vegetables and ingredient before you begin cooking. Make the coriander oil and have this ready for when you serve. Place the noodles in a large bowl and cover with boiling water. Leave the noodles in the water until soft and then drain. Try to time this so the noodles are still warm as you finish cooking the stir fry. Meanwhile add a little garlic infused oil to the wok and sweat the green salad onion leaves, ginger and strips of red pepper. Increase the heat under the wok and using a long handled spatular or spoon toss the vegetables so they cook evenly. Add the sliced mushrooms, if using, and your chosen meat or prawns and continue to cook making sure you move the ingredients around the pan. Add a little of the miso stock to moisten the vegetables and flavour with soya sauce if needed. Make the coriander oil; place the oil, coriander, chives and seasoning in the goblet of a food processor and liquidise. Add a splash of lemon juice. Add more oil if you need to. You should be able to drizzle the coriander oil. Place a knot of noodles in a bowl and top with the stir fry. Drizzle with the coriander oil and scatter with the toasted sesame seeds. 28 Jun	This entry was written by Joan Ransley and published on June 28, 2016 at 10:57 am. 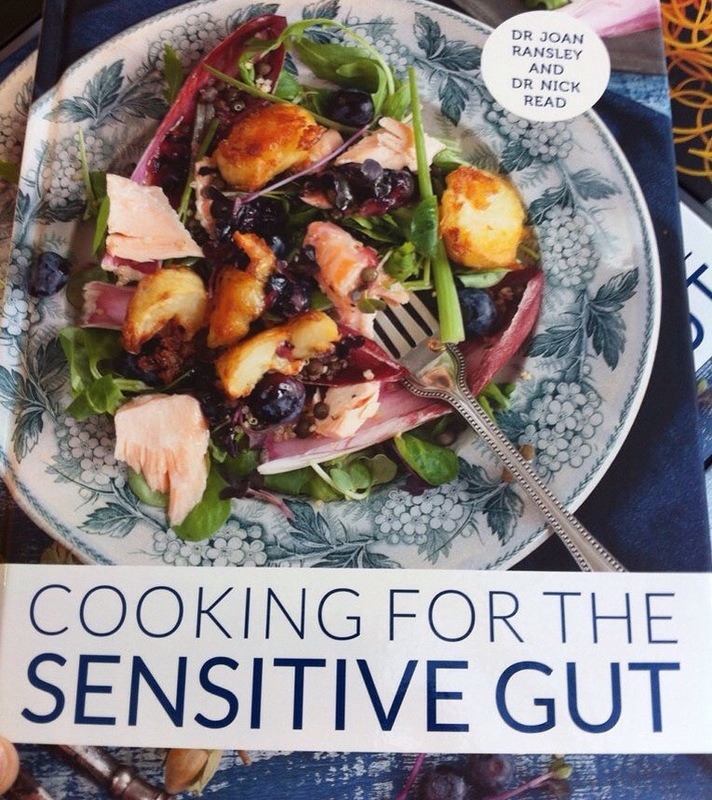 It’s filed under Dinner, Lunch, Side dish, Side dish and tagged healthy eating, IBS, Irritable bowel syndrome, LowFodMap, Sensitivegut. Bookmark the permalink. Follow any comments here with the RSS feed for this post.